We just went on a mini 4 day vacation to Las Vegas and if you follow my Instagram account you saw how bad I ate for four days in a row, and I didn’t even post all of it. I kept saying as soon as I get home I’m going on a healthy diet, well here it is and by the end of the day I was making loaded s’mores :). I never last. That’s just how I do it though, I stick with a healthy breakfast, lunch and mostly healthy dinner then I have a little dessert every day, I just can’t break the habit nor do I really want to. I got the idea for this from my brother-in-law. They came with us on vacation and he was wise and brought along all these healthy lunches. One of them was just quinoa, chicken and corn and it actually looked so good next to my turkey sandwich. I thought I’d jazz it up a bit and I added some lemon and zucchini and a bit of green onion and garlic for more flavor. 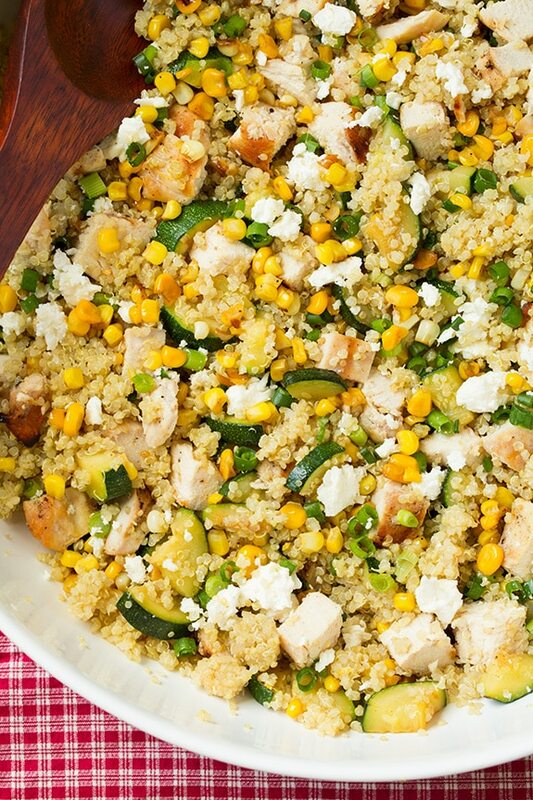 Oh and you can never go wrong with feta, right? 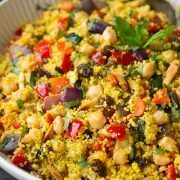 It’s a simple entree and it makes for a great lunch or dinner. My husband couldn’t get over how good it was and he said he wanted it for his lunch every day. 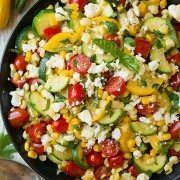 During the summer I’m sure I’ll be making it frequently with all the zucchini and corn in season. 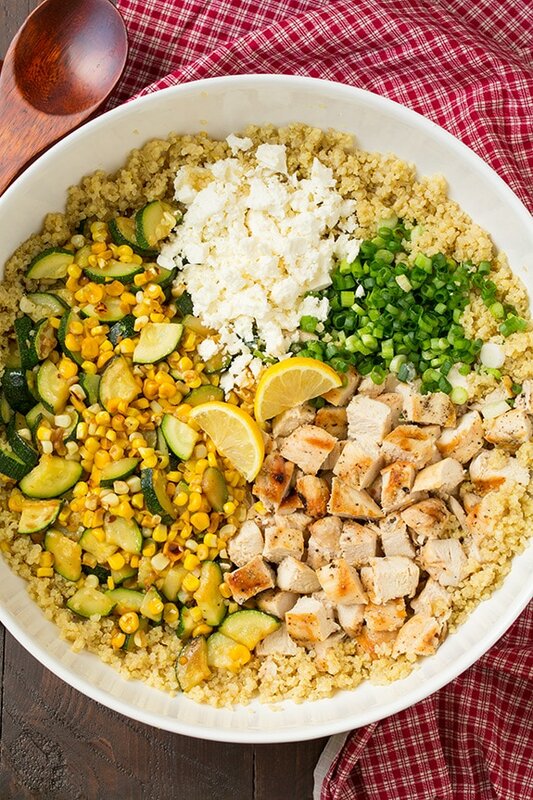 I need more healthy bowls in my life and this one is a great start! 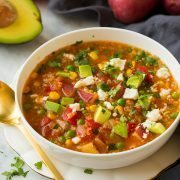 Keep in mind this is a versatile recipe, you can make this a Mexican inspired dish by adding some fresh cilantro and replace the feta with cotija cheese, or you can make it Italian by replacing the green onion with fresh basil and parsley and add a little red onion if desired. 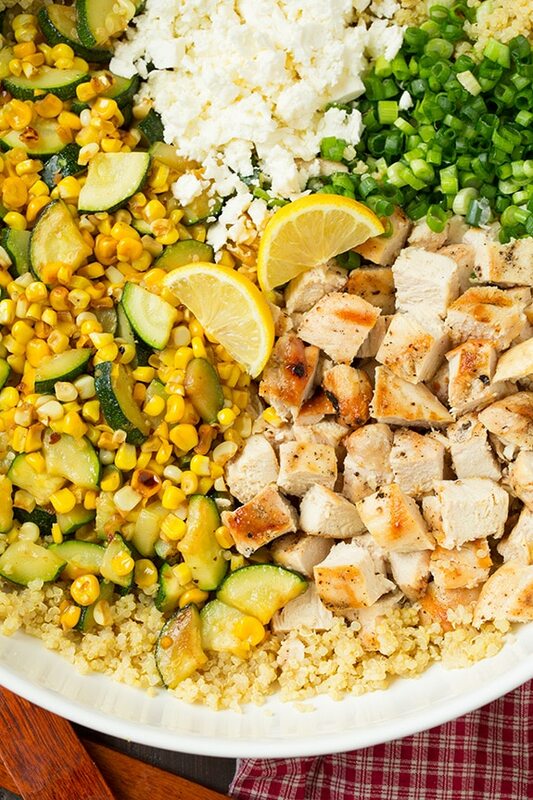 Healthy quinoa bowls layered with fresh corn and zucchini and lean chicken breasts. These are super flavorful thanks to the bright fresh lemon. Cook quinoa in chicken broth according to directions listed on package, season lightly with salt and pepper. Let cool slightly once cooked and toss with 1 Tbsp olive oil and 1 tsp lemon zest. Meanwhile heat 2 Tbsp olive oil in a large skillet over medium-high heat. Add garlic and saute 10 seconds, then add zucchini and corn and saute, tossing only occasionally so veggies lightly brown, about 8 minutes. 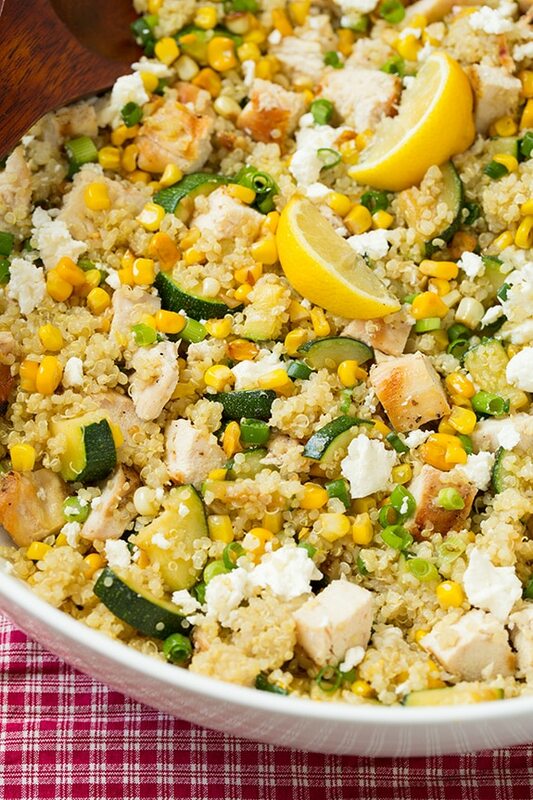 Pour quinoa into a large bowl (or individual bowls and just divide all ingredients among bowls), top with grilled chicken, zucchini and corn mixture, green onions and feta cheese. Drizzle lemon juice over top and toss mixture. Serve warm.